Companies from all over the world do business in Kuwait, and you can be one of them when you forge new connections using this Kuwait email database. 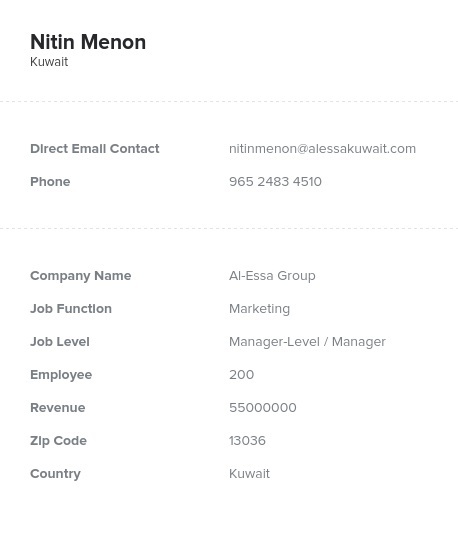 Get the business list you need to grow your revenue and find customers in Kuwait! In Kuwait, entrepreneurship is growing, and with all of these new businesses comes demand for new products and services to help them thrive. Take advantage of these opportunities and form mutually beneficial B2B relationships with our Kuwait mailing list and you're sure to help both Kuwaiti businesses and your own! Just download the .CSV file of this pre-built business database, plug it into your sales software, and you'll have a wealth of valuable sales leads right at your fingertips. This isn't just a generic lead list, either: It's filled with real names, phone numbers, mailing addresses, email addresses, fax numbers, and company details that you can use to make direct contact with the people who matter most to your marketing campaign. And our Kuwait email list is both machine-analyzed and human-verified to ensure that it's accurate, so you won't waste time sending messages that won't get to their intended recipients. We even offer a deliverability guarantee: That's how confident we are about the quality of our email marketing lists! Buy this Kuwait email database today: It's a surprisingly affordable, incredibly valuable resource that can position your business leaps and bounds ahead of the competition. You'll wonder how you ever got by without Bookyourdata.com!